Ultra-light wire gate ANGE S and ANGE L carabiners: Petzl's MonoFil Keylock ensures smoother opening and closing of the carabiner and a much longer lifetime compared to traditional wire gate carabiners. 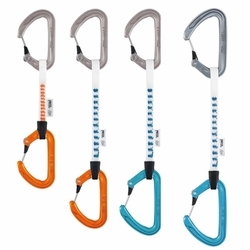 The unique H-profile of the carabiner allows an optimal size and strength-to-weight ratio. The FINESSE 10 mm wide Dyneema® sling offers an excellent weight to strength ratio. The STRING S holds the rope end carabiner in place and helps protect the webbing from abrasion.